Know how, though Hollywood has made fantastic adaptations of Broadway musicals, they have made some that need to be tried again. They already remade *South Pacific*, and it is so horrible, it makes the original film look like the greatest movie ever made. There's been some talk of remaking *My Fair Lady*, and I welcome that. I hate the original film, for all sorts of reasons. They remade *South Pacific* ? Really? When was that? I missed it. I do agree on *Camelot*, which really should have been better. The same for *Man of La Mancha*, which just didn't do justice to the stage musical. A long time ago, they were talking about an animated adaptation of *Cats*, a project which I guess was abandoned when they put out a DVD of the Broadway version. I do wish they'd reconsider making it as an animated movie. In 2001. If you missed it, consider yourself lucky. It's horrible, on every possible level. Ah, it doesn't look like a theatrical release. No wonder - I tend to avoid made for TV/cable musicals, even when they're supposed to be good. Then you've missed out on some of the finest films ever made. SOUTH PACIFIC isn't one of them. I make no differentiation, because of venue. Most of the worst films I've ever seen were in a theater. Yes, it's true, I may have missed out on some good stuff, up to now. But if it's good enough, I imagine I'll get around to it eventually. One that I believe was made for TV or cable was a recent version of "Porgy and Bess". From what I have read, it might be better than Otto Preminger's theatrical version. In any case, I do hope to watch whichever one of the two is the better one, eventually. As Otto Preminger's theatrical film version is one of the worst films ever made, making a better one isn't that much of an accomplishment. You might be right about that. However right now I don't care about how much of an accomplishment it is. I'd just rather watch the better version before the weaker adaptation. Maybe after I've watched both of them I'd be more inclined to discuss the actual accomplishment or lack thereof. 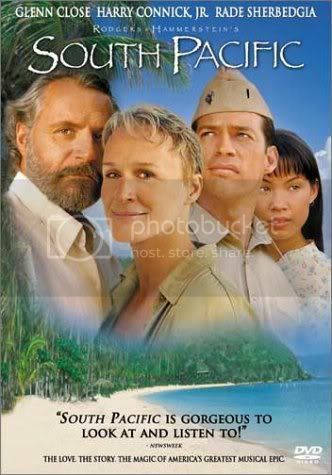 I also did not realize that "South Pacific" had been remade. Perhaps you were thinking of a TV version a few seasons ago with Glenn Close? I 100% agree about remking Man of La Mancha---with SINGERS this time. It reminds me of the Pinky and the Brain parody of Man of La Mancha. I think so, Brain, but why would Sophia Loren want to do a musical? I also agree that some of the best musicals to be made were on TV. The TV version of Annie was a far better film than the original, which had the planet's worst Annie. Even though the film's cast was better it dragged and was miserable to watch. I also greatly enjoyed the recent TV "Once Upon a Mattress", though they cut too many things. > I also did not realize that "South Pacific" had been remade. Perhaps you were thinking of a TV version a few seasons ago with Glenn Close? Huh? "Perhaps"? I *said* it was the TV version with Glenn Close. I even included a photo!! Just because a film is made for television, doesn't negate it as a film. It's still a film. In fact, it was shown in theaters, in other countries. It's remains a remake of the original film, regardless where it was shown. As for Harry Connick singing Rodgers and Hammerstein, I thought he was awful. He was the one thing I thought would be good, and I didn't like him at all. I'll stick with John Kerr being dubbed by Bill Lee. Speaking of South Pacific, I saw it at the Hollywood Bowl with most of the same cast as was in the concert at carnegie hall---Brian Stokes Mitchell and Reba McIntyre. The video of that concert is the best version on film. (When a concert upstages you, that's sad). But I recommend it. >I 100% agree about remking Man of La Mancha---with SINGERS this time. It reminds me of the Pinky and the Brain parody of Man of La Mancha. I am not familiar with Pinky and the Brain, but in any event, it was rather sad to see such charismatic actors as O'Toole and Sophia Loren stuck in such a joyless effort. They deserved better, and so did audiences. Hopefully, a new version of this great musical is not an impossible dream. Ooh, yes, that would be an excellent cast for "Man of La Mancha". It would be nice to get someone who has experience as Don Quixote, too. I saw Brian in concert about 2 1/2 years ago, and he was magnificent. He, naturally, saved "The Impossible Dream" for his encore, and it was perfect. I am actually all for a remake of "Camelot". I didn't like the film version at all. This is one of my favorite Broadway shows, and the film is such a major disappointment. TV's *Annie* was indeed very good, as was the Bette Midler *Gypsy* done for TV. Many of the musicals mentioned repeatedly, *Man of LaMancha, Camelot* in particular, are among my all-time least favorite. I don't want them to be remade, I just want them to go away. *South Pacific* and *My Fair Lady* are better examples in my book. The source shows themselves are excellent, and both come across as bloated and leaden (to me)onscreen in their original attempts. *Godspell* and *Jesus Christ Superstar* might also benefit from a remake. While neither is actually bad ( *Godspell* holds up surprisingly well --- and I defy you not to be devastated when they do the musical number on top of the World Trade Center, it made _this_ New Yorker cry), they are very much "of the 70's." Again, the music is great in both shows. And one of the interesting things about *Godspell* is that the original theatrical musical has absolutely no staging instructions, so a remake could be completely original while remaining true to the source. > TV's Annie was indeed very good, as was the Bette Midler Gypsy done for TV. I should really add those to my list as well, I guess. As for "Jesus Christ Superstar", there was a new version made around 2000 that apparently was straight to DVD, it's a bit more cutting-edge than the 1973 Norman Jewison film. I like both of them, but the more recent one is, well, edgier. I forgot about the TV Gypsy--that one's really good--in my opinion, better than the original film, but that's because I love anything Ed Asner does. I don't blame the person that wants Camelot and La Mancha to jsut go away---I like to pretend the movies never happened, myself, and just listen to the broadway recordings. Really? I hate the TV version of *Gypsy*. Yes, it is a more complete version of the musical, but I find it lifeless and dull. I love the 1962 theatrical film version. Nothing lifeless or dull about it. And, you just cannot beat the three strippers in that film. Nobody comes close! I do love Cynthia Gibb in the TV movie, though. well, I liked the TV gypsy. ANd I completely agree--nothing can come close to the original strippers. But I'd much rather they remake it with the recent broadway cast. > well, I liked the TV gypsy. ANd I completely agree--nothing can come close to the original strippers. But I'd much rather they remake it with the recent broadway cast. Did you watch it recently? (On Broadway, I mean).